Much has changed between President Donald Trump and German Chancellor Angela Merkel since he became president, moving their relationship built on sometimes-disparaging public comments to one of "unbelievable chemistry," according to Trump. The two world leaders first met at the White House in March, and then again at the NATO summit in Brussels in May. Now they're expected to meet again at the G-20, adding another chapter to the increasingly complicated relationship. Republican Presidential candidate Donald Trump holds a campaign event at the Kilcawley Center at Youngstown State University on August 15, 2016 in Youngstown, Ohio. Back in August 2015, Trump complimented Merkel in an interview with Time magazine. The kudos for the German leader came at the expense of U.S. lawmakers, whom Trump was criticizing for financially supporting the Ukrainian government in its fight against Russian-supporting separatists. "Germany’s, like, sitting back silent collecting money and making a fortune with probably the greatest leader in the world today, Merkel," Trump told Time. "She’s fantastic … highly respected." But just two months later, Trump questioned the chancellor's judgment about Europe's immigration and refugee crisis in a "Face the Nation" interview. "I love a safe zone for people. I do not like the migration. I do not like the people coming. Frankly, look, Europe is going to have to handle -- but they're going to have riots in Germany. What's happening in Germany, I always thought Merkel was like this great leader. What she's done in Germany is insane. It is insane. 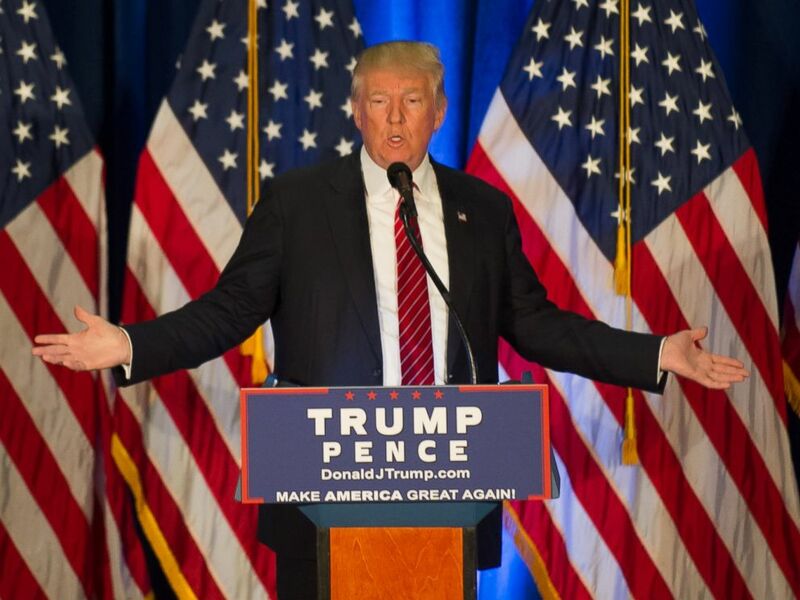 They're having all sorts of attacks," Trump said in the October 2015 interview. The following year, in a campaign speech in Ohio in August, Trump compared his then-rival Hillary Clinton to Merkel, and not in the kindest way. "Hillary Clinton wants to be America’s Angela Merkel, and you know what a disaster this massive immigration has been to Germany and the people of Germany. Crime has risen to levels that no one thought would they would ever see," Trump said. "We have enough problems in our country, we don’t need another one," the then-candidate added. For her part, Merkel was fairly restrained overall in the few comments she made about Trump before he was sworn in. Instead, she openly praised Trump's predecessor. American President Barack Obama and Federal Chancellor Angela Merkel on the red carpet in front of the Federal Chancellery, Berlin, Germany, Nov. 11, 2016. 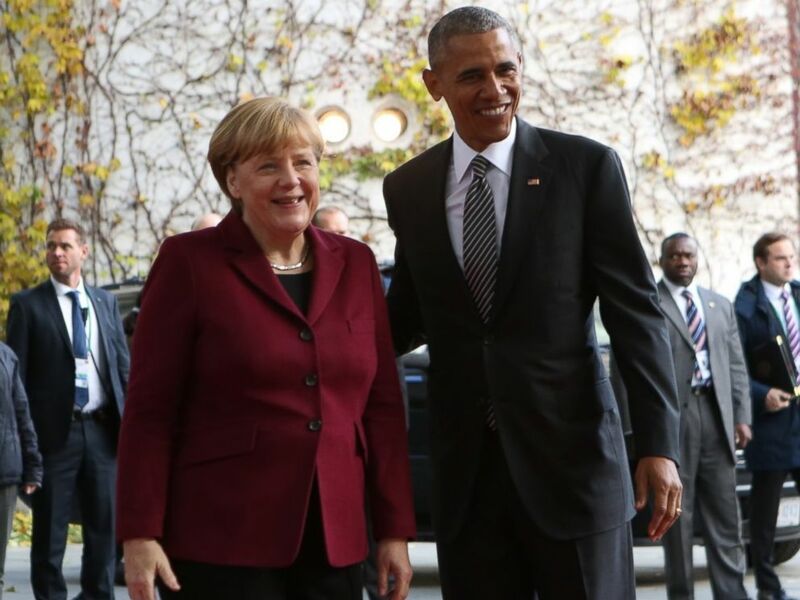 Former President Barack Obama included Germany on his final foreign trip in November, saying that Merkel had "probably been my closest international partner these past eight years." Merkel thanked Obama for "a good, friendly and intensive partnership," adding, "It’s hard for me to say goodbye." When the German leader congratulated Trump for his election win, she took the opportunity to offer a bit of a warning. In a letter to Trump the day after the November election, Merkel started by congratulating him and finished by wishing him "a sure hand, [and] every success." But in between she worked in some potentially loaded comments. "Germany’s ties with the United States of America are deeper than with any country outside of the European Union. Germany and America are bound by common values -- democracy, freedom, as well as respect for the rule of law and the dignity of each and every person, regardless of their origin, skin color, creed, gender, sexual orientation, or political views. It is based on these values that I wish to offer close cooperation, both with me personally and between our countries’ governments," she wrote. "Partnership with the United States is and will remain a keystone of German foreign policy, especially so that we can tackle the great challenges of our time: striving for economic and social well-being, working to develop far-sighted climate policy, pursuing the fight against terrorism, poverty, hunger, and disease, as well as protecting peace and freedom in the world," the letter continued. When White House photographers gathered in the Oval Office to take pictures of the pair seated next to one another, video caught someone in the room suggesting that the two shake hands. While Merkel appears to turn to look for a shake, Trump keeps looking ahead, appearing to ignore her. In subsequent interviews, Trump denied hearing someone suggest it, and said that they shook hands before the cameras were in the room. "Yeah well, believe it or not I had a great relationship with Chancellor Merkel. They come up with this thing about shaking hands -- I shook her hand four times before I sat down -- and it turns out that either a reporter or somebody said, shake her hand. I never heard it, but I would have been glad to shake ... and they made the shaking of the hands ... a big deal," Trump said in an interview with The Washington Examiner nearly two months later. "There's so much noise because they're all going crazy. But, I was with her for a long time before that, and I shook her hand on numerous occasions. We get along great, OK? Merkel," Trump said in the May 1 interview. Another awkward moment came during their joint press conference, when Trump appeared to take a dig at Obama using his own unfounded claims that Trump Tower was wiretapped. Trump joked that he and Merkel "have something in common," referring to reports that the Obama administration had listened to Merkel's cellphone calls. The moments do not appear to have hardened the friendship, at least not on Trump's end. In an April 23 Associated Press interview that coincided with his first 100 days in office, Trump said "it’s funny: One of the best chemistries I had was with Merkel." When asked if he was not expecting to have a good relationship with her, Trump said he wasn't "because, um, I’m at odds on, you know, the NATO payments and I’m at odds on immigration. We had unbelievable chemistry. And people have given me credit for having great chemistry with all of the leaders." Even though Trump has been touting their relationship since their White House meeting, Merkel has made two notable comments that could be interpreted as slights against her American counterpart. After a meeting at the NATO summit, during which several world leaders were unable to reach an agreement on climate change with Trump, the Associated Press reported that Merkel said, "The times in which we can fully count on others are somewhat over, as I have experienced in the past few days." Merkel's spokesman Steffen Seibert followed up by saying her comments stand for themselves but she is "a convinced trans-Atlanticist." He said German-U.S. relations "are a strong pillar of our foreign and security policy, and Germany will continue working to strengthen these relations." And then, in an article published in German magazine Die Ziet on the eve of her expected meeting with Trump, she noted their philosophical differences in how they view the world. "While we are looking at the possibilities of cooperation to benefit everyone, globalization is seen by the American administration more as a process that is not about a win-win situation but about winners and losers," she said in the interview with Die Zeit. While we are looking for ways to work together for all-round benefits, globalization in the US administration is seen as a process that is not about win-win situations but about winners and losers," she was quoted as saying in the article. When asked about national security adviser H.R. McMaster's world view, which the interviewer summarized as one in which he "does not believe in a global community," Merkel responded "that completely contradicts my view."